While I think there is some amount of credential inflation happening here, I think you are overlooking the big drivers. In education, getting a master’s degree is how you climb the career path and bump up your salary. 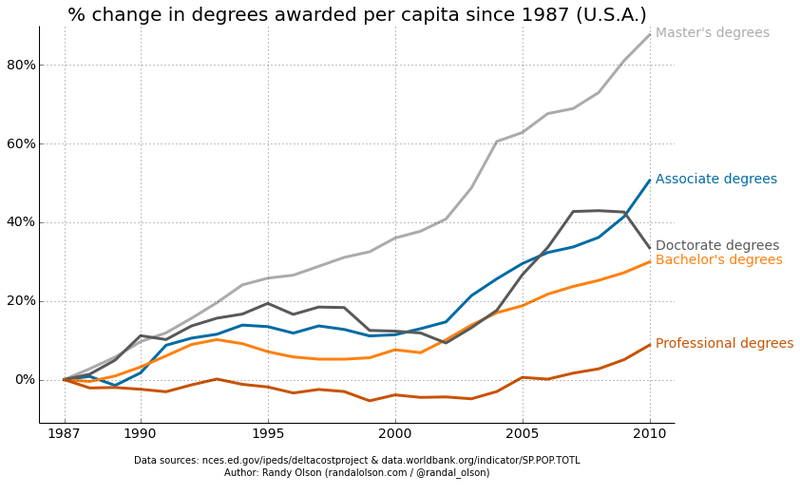 So there is tremendous incentive to get a master’s degree. In some fields, a master’s degree is desirable because not enough content can be fit into the 4 year undergraduate major. When I was working in industry, I noticed that most of my software development colleagues had master’s degrees or were working on them, simply because they wanted to learn things like advanced software design, distributed systems, or data mining, things they couldn’t jam into their undergrad years, and which are of value to employers. In fact, every company I worked at paid for people to get their master’s in CS. Finally, the master’s degree functions as the career-changers degree, and as people become increasingly mobile in their careers, the need for these degrees increases. For example, a master’s in healthcare informatics is a very popular way for nurses to leave the clinical side and break into the IT side. There is a boomlet in master’s degrees in Big Data, again, mainly serving as a pathway for people to move into the field. I had colleagues in software dev who went for master’s degrees in finance in order to move to the financial side of the company. These are all real master’s degrees, not “fluff” at all, and they serve an important purpose, facilitating movement between career paths.